Apparently it takes me a whole week to post recipes for a single dinner. How do people post everything before or on the actual day? How? Do you test everything in advance? Or maybe it's pictures from previous years? Or perhaps you are superwoman/man? Whatever the method...color me impressed. But I will be content with bringing up the rear. Bringing up the rear with pies, even! At our turkey day dinner...there is always pie. Pies. Plural. 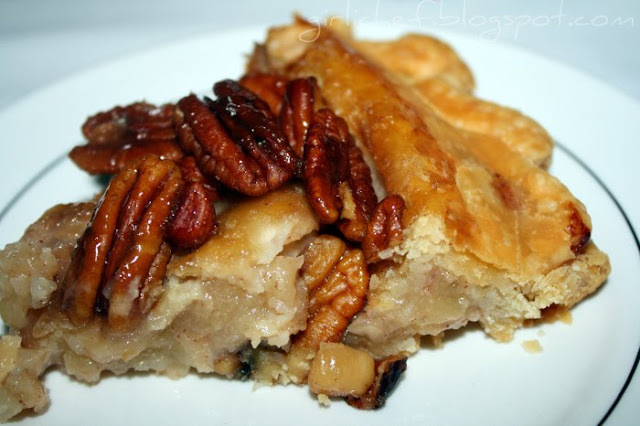 The dinner is NOT complete without at least a Pumpkin pie and a Pecan pie. At. Least. There is usually at least one more pie...and occasionally even another type of dessert thrown in. This year we ended up with 4 pies. Grandma already said she was bringing the pumpkin and pecan...so I was left coming up with the alternate. 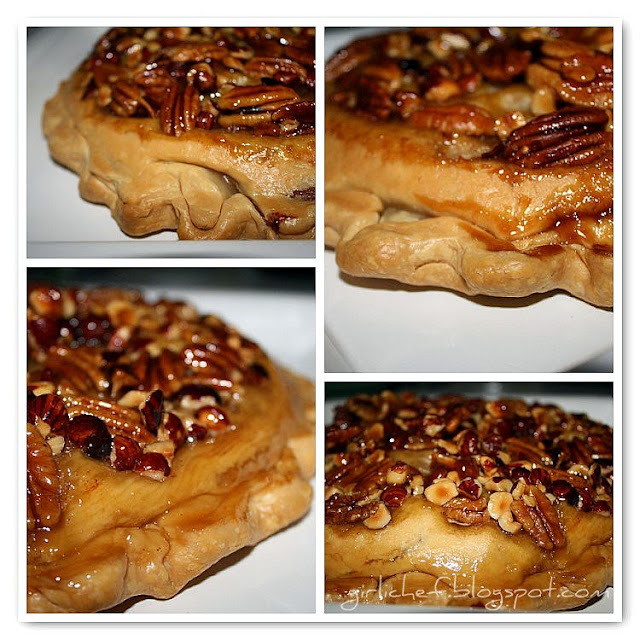 Many years that ends up being a Bourbon Sweet Potato pie...which is a favorite or Apple w/ a Cheddar crust, a favorite as well...but this year, when I was blog surfing, I happened upon a scrumptious looking beauty from Ingrid over at 3 B's! I knew the minute I saw it that this would be the one to try this year. Ingrid's pie called for a store-bought Pillsbury pie crust. While I usually like to make my own pie crust, I'm not averse to using store-bought ones. Sometimes convenience is key. And as fate would have it, I was recently contacted by Pillsbury...concerning their pie crust. Coinkeydink? I think not. And in tracing back the origins of Ingrid's pie, I found the original...of all places...on the Pillsbury website. It was definitely meant to be. Place nuts in bottom of a 9" pie plate. 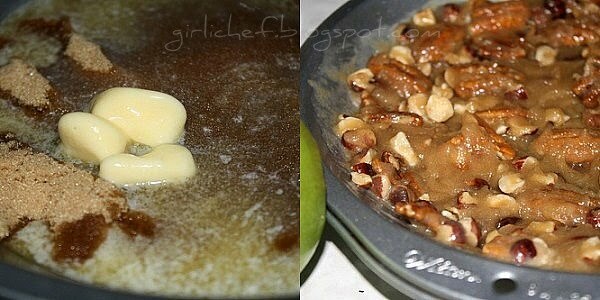 Combine butter and brown sugar and add to pie plate...spread well over bottom. 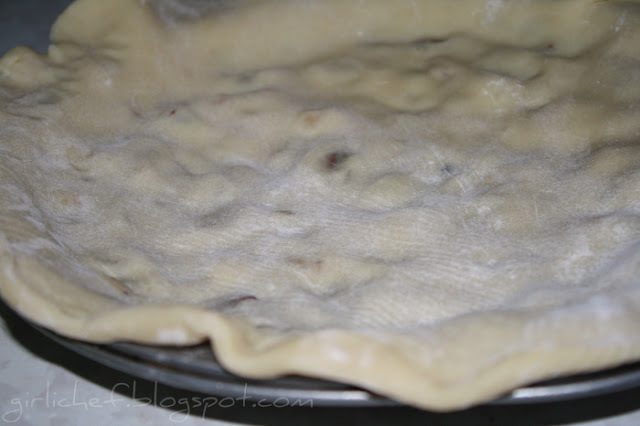 Cover with one pie crust. 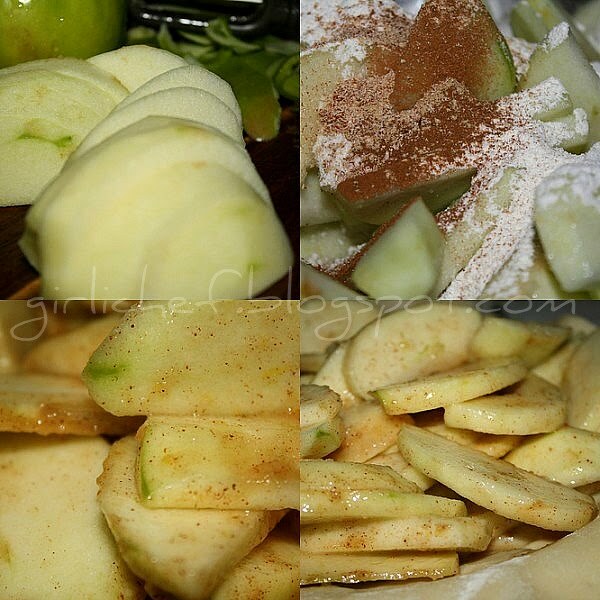 Prepare your apples then toss with remaining ingredients. Let sit for 15 minutes. Pour into bottom crust. 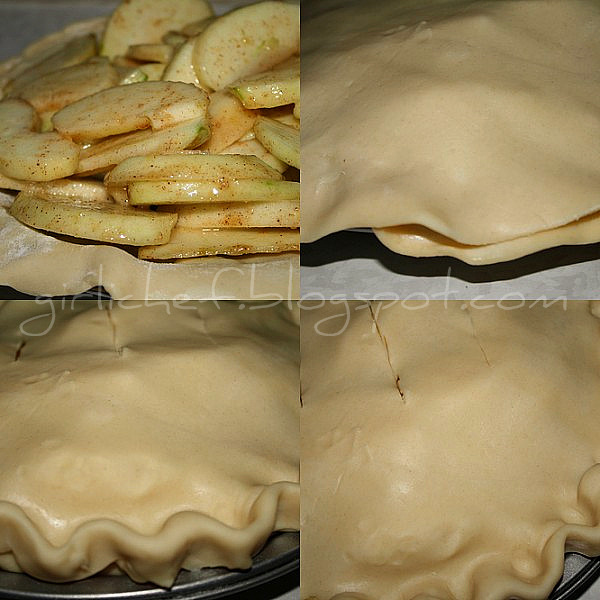 Place 2nd pie crust over the filling and tuck edges of top crust under bottom. Crimp as you wish. Cut a couple of slits in top for venting. Place in oven and bake for 10 minutes. Reduce heat to 350 and continue cooking for about 45 minutes or until golden and bubbly. Place a serving plate w/ a slight rim upside down over the pie and quickly flip the whole pie over. Once the pie was completely cool, I covered it and kept it on the counter overnight (made it a day in advance). And this is what it looked like once sliced. It was good...everybody liked it. I don't think it's going to beat out the cheddar-crusted apple...but it'll probably show up again sometime. I also told you I'd share the rest of the pie recipes. By now you've seen that our dinner on that day is pretty traditional...and when grandma makes the pies, she uses the traditional recipes...in other words, Libby's and Karo. I usually change them up a little, but some people tend to gripe, so. Fine. Whatever. 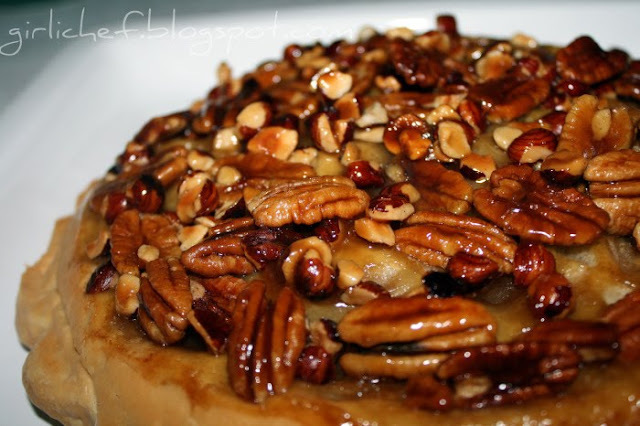 Of course, when I make the RumRunner Pecan Pies, people seem to be just fine with those.